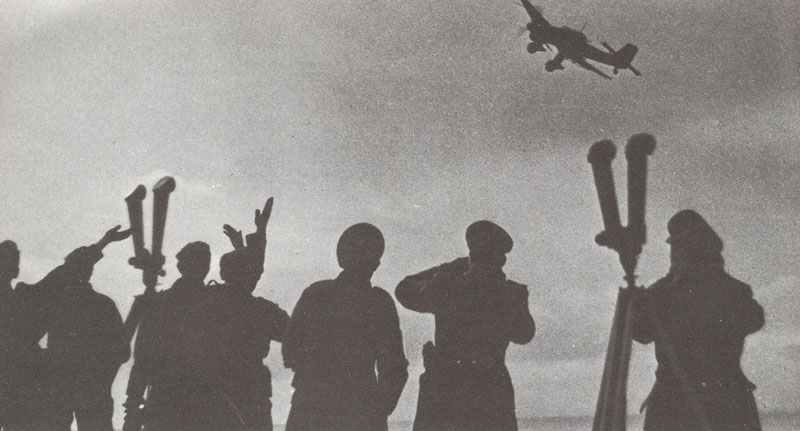 Picture from this day at the French coast near Cape Griz Nez, the staff of Luftflotte 3 waves to a Ju 87 Stuka dive-bomber. Heavy German raids on shipping off English South Coast, radar stations (inc. Ventnor), and airfields. Losses: German, 32; British, 21. 5 Hampdens (2 lost) attack heavily defended Dortmund-Ems Canal with delayed-action bombs; Flt.-Lt. Learoyd, VC, secures vital hit, which stops passage of invasion craft for 10 days (night August 12-13).